World War I was entering its fourth demoralizing year, and the Allies were hoping to break the grueling stalemate by sending thousands of fresh American troops and more munitions than ever to the trenches of France. The French freighter Mont-Blanc set sail from Brooklyn on December 1, 1917 with a massive total of 3,000 tons of explosives aboard. The explosives were so volatile the Captain Aime Le Medec took unprecedented safety measures, which included banning the crew from smoking, lighting matches, or even touching a drop of liquor. They even secured the volatile cargo with copper nails because they do not spark when struck, and they knew it would only take one spark to blow them up. For four harrowing days, the floating powder keg moved up the Eastern seaboard, plowing through a wicked snowstorm and waters filled with German U-boats which had already torpedoed more than a thousand Allied ships that year alone. But it was in Nova Scotia where disaster awaited. On December 6, 1917, the exhausted crew finally made its way to Halifax Harbour, just as the relief ship Imo was about to leave. At 8:46 a.m., the Imo struck the Mont-Blanc's bow, which knocked over barrels of airplane fuel. Fire swept across the decks, sending the Mont-Blanc's crew scurrying to lifeboats, while Halifax longshoremen, office workers, and schoolchildren walked down to watch the ship burn. A 9:04:35 a.m., the Mont-Blanc erupted, leveling 2.5 square miles of Halifax, killing 2,000 people and wounding 9,000 more in one-fifteenth of a second. The Great Halifax Explosion was the largest manmade detonation ever prior to the Atomic bomb. 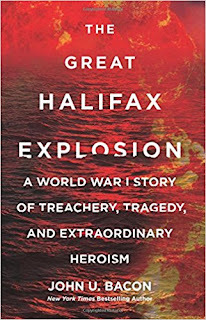 Historian John U. Bacon combines research and eyewitness accounts to re-create the recklessness that caused the tragedy and the selfless rescue efforts that saved thousands, and the inspiring resilience that rebuilt the town in The Great Halifax Explosion: A World War I Story of Treachery, Tragedy, and Extraordinary Heroism. In the immediate hours after the explosion, Boston sent 100 doctors, 300 nurses, and a million dollars, which is about $20 million today to aid in the response. To this day, Halifax still sends an annual Christmas. As one Nova Scotian said, 'Why do we have to stop saying 'Thank you!'?" The tree is Boston's official Christmas tree and is lit on the Boston Common throughout the holiday season, though few Bostonians know where it comes from, or why. The explosion was the world's first "weapon of mass destruction." It showed theoretical physicist J. Robert Oppenheimer how much destruction an atomic bomb could inflict on a city. Oppenheimer was known as the 'father of the atomic bomb' and director of the Los Alamos Laboratory that housed the Manhattan Project. He determined the A-bomb would be three to five times more powerful than the Halifax Explosion and his calculations were proven to be correct. Canada and the U.S. had 141 years of hostility and mistrust and the Halifax Explosion inspired the two nations to work together and forge a bond that paved the way to a century of peace and prosperity. Unlikely heroes surfaced everywhere in the aftermath of the explosion. The city of Halifax was completely unprepared for the disaster, but city leaders formed committees within two hours, putting egos, turf wars, and protocols aside, and were amazingly effective. 90 percent of the victims were treated within 24 hours. Individual citizens became heroes, like train dispatcher Vince Coleman. When he learned the ship had explosives, he told his staff to run for their lives, but he turned around to send urgent messages to incoming trains: "Hold up the trains," he wrote. "Ammunition ship afire in harbour will explode. Guess this will be the last message, Good-bye, boys." Bacon has a personal connection to the story. The author first heard about the Halifax Explosion from his Canadian grandfather, and for decades it fell back in his memory until he researched the book's main character, Joseph Barss, while writing his first book. The story captured his imagination, and he learned his grandfather hadn't exaggerated the calamity, but in fact, understated it. 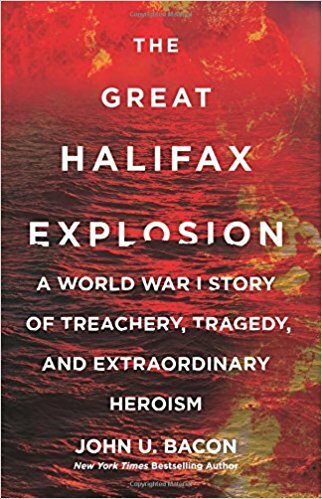 The Great Halifax Explosion is a very compelling work about a part of unknown World War that deserves the same focus as other stories about the epic battle.